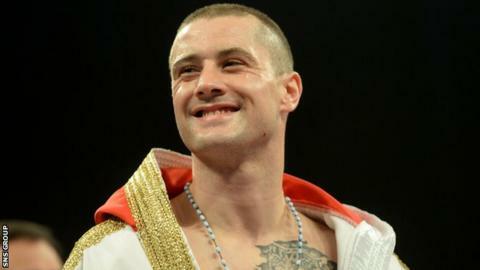 Ricky Burns will take on Dejan Zlaticanin in Glasgow on 27 June for the WBC international lightweight belt. The 30-year-old Montenegrin southpaw is unbeaten in 18 fights and the WBC has approved the contest as an official eliminator for their world title. It will be Burns's first return to the ring since losing his WBO world title to Terence Crawford in March. That unanimous points defeat for the 31-year-old Scot ended almost four years as champion in two divisions. "I'm just looking forward to getting back in the ring," Burns told BBC Scotland. "I was gutted after losing the last fight but I ended up straight back in the gym and it's made me more determined. I believe I've got a third world title in me. "My attitude towards boxing hasn't changed. I've still got the hunger." The Coatbridge boxer had previously been lucky to hold on to his belt after a controversial draw with Raymundo Beltran, during which he suffered a broken jaw. And that bout followed an unconvincing win over Jose Gonzalez, who was forced to retire with a wrist injury. Burns will be trained for the summer fight by Tony Sims, following his split from Billy Nelson. "I felt that I had to make a change," explained Burns. "I needed some new ideas and to freshen things up a bit. "Before the last fight, we went down to Tony's gym for a week and I liked what I saw. "I'm so much happier with myself and, with this fight, I've got a point to prove. I'm looking forward to getting out there and putting on a show for the Scottish fans." Zlaticanin is ranked ninth on the WBC list and this will be his first bout outside of the Balkans. The WBC main belt is currently held by Omar Figueroa, who has been ordered to defend it against fellow Mexican Daniel Estrada in the coming months. Glasgow light-welterweight Willie Limond will defend his Commonwealth title against British champion Curtis Woodhouse on the same bill, while cruiserweight rivals Stephen Simmons and Wadi Camacho will go head-to-head at the Braehead Arena.